MatteSpect is a fun, creative and powerful new way to decorate your photos. You can use any color, picture, or image you want to matte your photos and create beautiful, personalized backgrounds. The only thing limiting you is your imagination! Just take a picture or load a photo in to decorate, choose any picture, background image, or color for your background, and infinitely configure and layer colors, photos and backgrounds to create a unique image never before possible in the world of photo apps. After you’re done with your masterpiece, share it with your family and friends on Instagram, Facebook and Twitter; e-mail it to them, or just save your creation into your photo library as a high resolution export. MatteSpect is the only app in the App Store that has “recursive matting”. What this means is that you can take whatever it is you’re working on, and use your entire creation as a customized, one-of-a-kind background that you constructed yourself. You can also load in your creation again as a new photo and layer another background over all of the work you’ve just done. You can even keep the layering going again and again to create something truly spectacular. All of this crazy functionality is yours with a single button press. Everything in MatteSpect is free. There are no $2 background packs or $3 sticker packs. All content will be given out free…always! We have new features and content every month, so all that you need to do is update the app, and a whole new world of photo creation possibilities will open up! We have a lot of updates coming in the future too, such as cool imaging processing effects, seamless tiling backgrounds to remove the seams on tiled backgrounds for a smoother look, and an iOS 8 photo app extension, as well as much more background packs and other content and updates. Again, all of this is free! Everything included with MatteSpect is free and always will be. The app features very powerful functionality with a very simple interface, so doing all of the powerful, creatively crazy things you want is as simple as pressing a few buttons and as fast as a few seconds! MatteSpect also has no push-notifications and full-page ads, and the regular version of MatteSpect has no ads at all. All this means no distractions and annoyances so you can create in peace. We have completely redesigned the app to give it a new, fresh look and a better interface. We have also added an entire decorate section so that you can now decorate your photos. The first thing we put in the app is drawing! 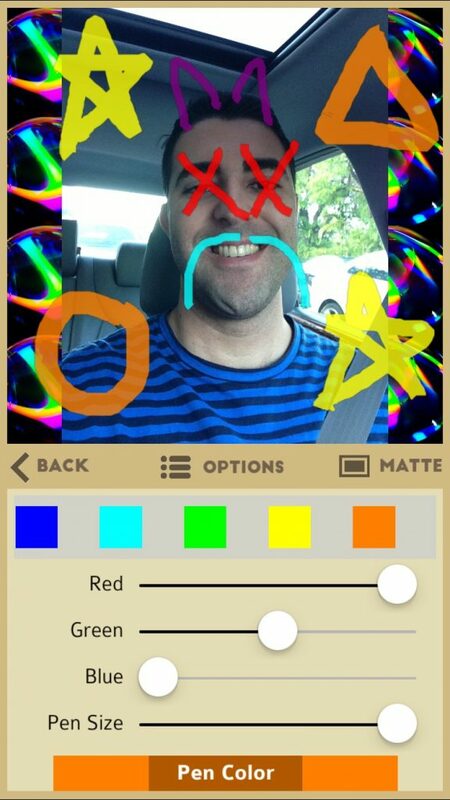 That’s right, you can now draw on your photos, and even use your drawn photos as personalized backgrounds! Also, we’ve continued to expand our background pack library and now have over 90 high-resolution background packs included free with the app. Remember, everything we add is free and always will be, so there’s no reason to not give MatteSpect a try.